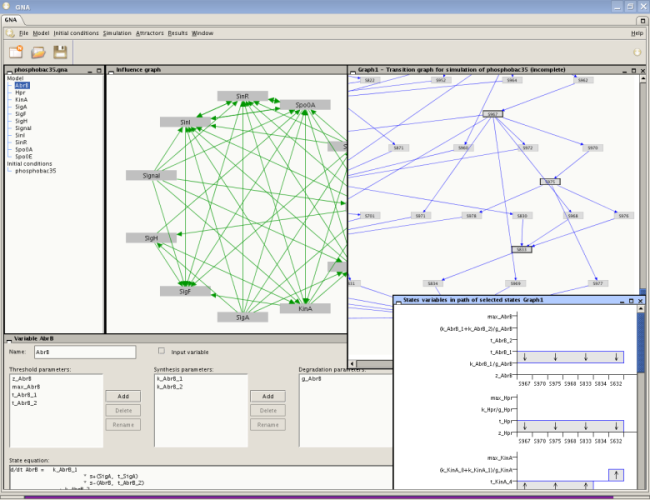 Genetic Network Analyzer consists of a simulator of qualitative models of genetic regulatory networks in the form of piecewise-linear differential equations. Instead of exact numerical values for the parameters, which are often not available for networks of biological interest, the user of GNA specifies inequality constraints. This information is sufficient to generate a state transition graph that describes the qualitative dynamics of the network. The simulator has been implemented in Java 5 and has been applied to the analysis of various regulatory systems, such as the networks controlling the initiation of sporulation in B. subtilis and the carbon starvation response in E. coli. See the website of Genostar for references to these and other examples. The export of models to the SBML Qual format. The automated verification of these properties on the state transition graph by means of standard model-checking tools, either locally installed or accessible through a remote web server. The semi-automatic generation of a prototype model from the network structure. Genetic Network Analyzer is freely available for non-profit academic research on the following download page. Non-academic users wishing to use GNA - or academic users wishing to use GNA for purposes not covered by the user licence - are invited to contact the Genostar company. Genostar has integrated GNA in its IOGMA environment for exploratory genomics. The main developers of GNA are Bruno Besson, Hidde de Jong, Pedro Monteiro, and Michel Page. H. de Jong, J. Geiselmann, C. Hernandez, M. Page (2003), Genetic Network Analyzer : Qualitative simulation of genetic regulatory networks, Bioinformatics, 19(3):336-344. G. Batt, D. Ropers, H. de Jong, J. Geiselmann, R. Mateescu, M. Page, D. Schneider (2005), Validation of qualitative models of genetic regulatory networks by model checking : Analysis of the nutritional stress response in Escherichia coli, Bioinformatics, 21(Suppl 1) :i19-i28. H. de Jong, M. Page (2008), Search for steady states of piecewise-linear differential equation models of genetic regulatory networks, ACM/IEEE Transactions on Computational Biology and Bioinformatics, 5(2):208-222. P.T. Monteiro, D. Ropers, R. Mateescu, A.T. Freitas, H. de Jong (2008),	Temporal logic patterns for querying dynamic models of cellular interaction networks, Bioinformatics, 24(16) :i227-i233. P.T. Monteiro, E. Dumas, B. Besson, R. Mateescu, M. Page, A.T. Freitas, H. de Jong (2009), A service-oriented architecture for integrating the modeling and formal verification of genetic regulatory networks, BMC Bioinformatics, 10:450, 2009. GNA uses the following open-source software : JGraph, SAT4J, and CUP. The model-checker web server at INRIA runs NuSMV.